A key aspect of the idea of a mirror world lies in its construction - the difference between a mirror world and any other virtual environment is that at least some part a mirror world is built from data collected from the real world, whereas other virtual environments can be entirely fabricated. On this page, I will examine some of the methods of data collection used in the construction of mirror worlds; specifically, mirror worlds as they relate to augmented reality. 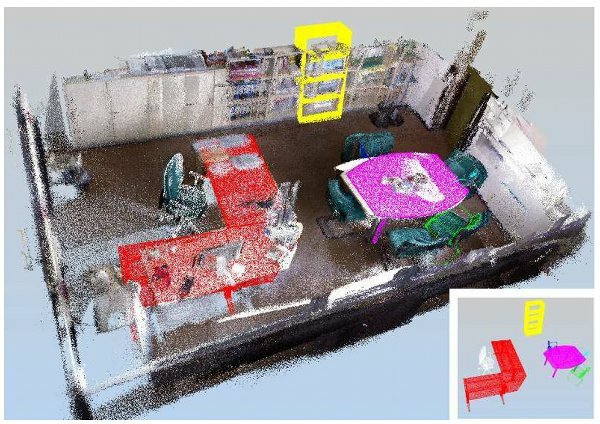 At this point, algorithms can be applied to this point cloud to create a solid 3D model from the point cloud, to which physics simulations can be added, leaving a digital representation of a physical space. This particular method of construction is shared by numerous 3d scanning solutions. Intel's realsense, Microsoft's Kinect, Google's Project Tango (which enables such cool augmented reality apps as Ikea Place) - all of these devices use this method. Sometimes, you do not need the level of fidelity afforded by bi-optical 3D scanning - instead, you might only need to know where in a room one can walk without bumping into something. In these scenarios, the processing overhead of bi-optical 3D scanners make them a less-than-ideal solution. With body tracking, you construct your mirror world based on input from a person or some other being who is physically occupying this space. The above video shows an example of body tracking based construction in the form of the HTC Vive. It's a Virtual Reality headset that allows the user to walk around a physical space in order to explore a virtual world based on the confines of the room; to walk around a mirror world. The Vive is a crossover of sorts - the headset does the computation, like in a inside out situation, but it is necessary to have lighthouse accessories all over the space you're trying to digitize. Benchoff, Brian. “3D Scanning Entire Rooms with a Kinect.” Hackaday, Hackaday, 10 Dec. 2015, hackaday.com/2015/12/10/3d-scanning-entire-rooms-with-a-kinect/. Cui, Yan, and Didier Stricker. “3D shape scanning with a Kinect.” ACM SIGGRAPH 2011 Posters on - SIGGRAPH 11, 2011, doi:10.1145/2037715.2037780. Langley, Hugh. “Inside-out v Outside-in: How VR tracking works, and how it's going to change.” Wareable, Wareable, 3 May 2017, www.wareable.com/vr/inside-out-vs-outside-in-vr-tracking-343. Ricci, Alessandro, et al. “The Mirror World: Preparing for Mixed-Reality Living.” IEEE Pervasive Computing, vol. 14, no. 2, 2015, pp. 60–63., doi:10.1109/mprv.2015.44.